Citation Information: J Clin Invest. 2005;115(2):224-227. https://doi.org/10.1172/JCI24238. Inositol-requiring enzyme 1 (IRE1) is a transmembrane protein that signals from the ER and contributes to the generation of an active spliced form of the transcriptional regulator X-box–binding protein 1 (XBP1). XBP1 is required for the terminal differentiation of B lymphocytes into plasma cells, and IRE1 also participates in this differentiation event. A study in this issue of the JCI reveals, quite unexpectedly, that IRE1 is also required early in B lymphocyte development for the induction of the machinery that mediates Ig gene rearrangement. Multiple sensors initiate the UPR in vertebrates. IRE1α and PERK are integral-membrane ER kinases whose lumenal domains are triggered by misfolded proteins in the ER. IRE1α and its yeast homolog, IRE1, contain a lumenal stress-sensing domain (blue) as well as cytosolic kinase (magenta) and endoribonuclease (RNaseL, red) domains. ATF6 is another stress sensor, which is cleaved in response to stress to yield a fragment (green) that is transported to the nucleus. Both ATF6 and Blimp-1 (not shown) may contribute to the transcriptional induction of XBP1. 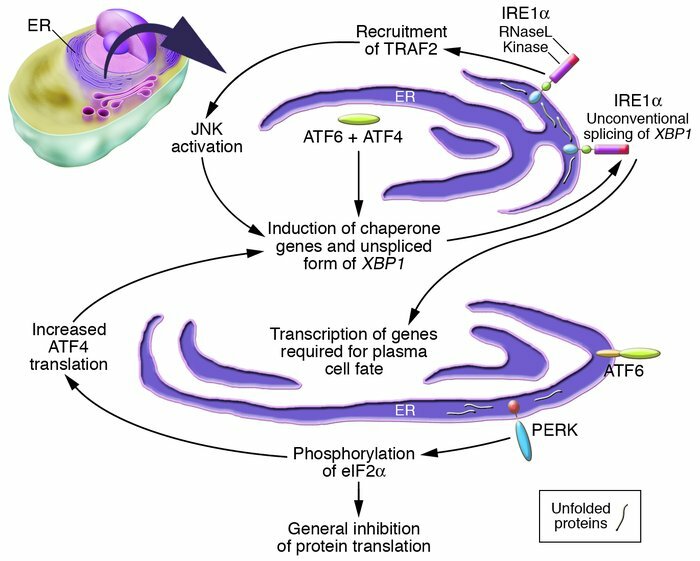 Very little is understood as to how IRE1α, a kinase that is activated by unfolded proteins in the ER, contributes to the induction of Rag1, Rag2, and TdT to initiate and sustain V(D)J recombination during early B cell development.